The countries sharing the Lancang-Mekong River are entering a new era of hydropolitics with a growing number of hydropower dams throughout the basin. Three ‘powersheds’, conceptualised as physical, institutional and political constructs that connect dams to major power markets in China, Thailand and Vietnam, are transforming the nature-society relations of the watershed. OPINION: How About Accountability Beyond Borders? The arrival of the ASEAN Economic Community in December 2015 marked a major milestone in the ambition of the countries of the region to become closer to one another through economic cooperation. It anticipates economic growth, and with it a growing role for large transnational and domestic corporations, as well as for smaller businesses. 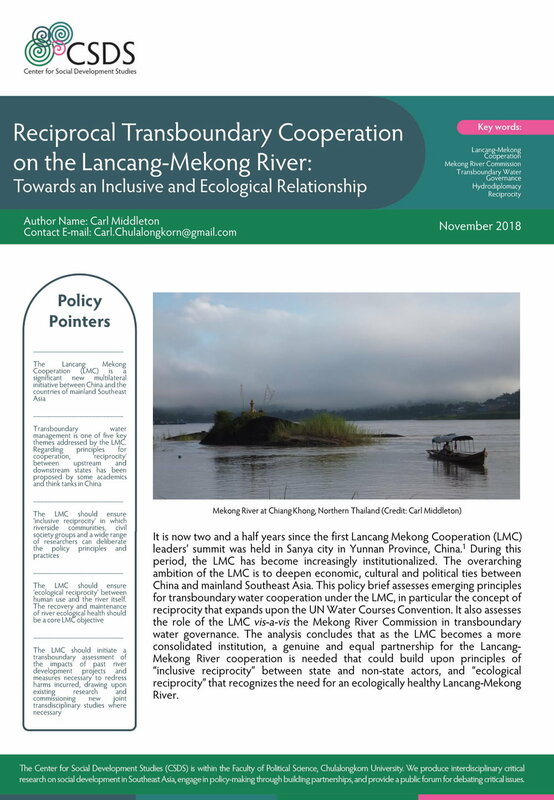 JOURNAL ARTICLE: Transboundary Water and Electricity Governance in Mainland Southeast Asia: Linkages, Disjunctures and Implications. In mainland Southeast Asia, plans for extensive hydropower development and regional power trade are increasingly underway with implications for transboundary water governance. This paper maps out the context, drivers, tools and arenas of water and electricity decision making, and examines the linkages and disjunctures between regional electricity and water governance frameworks.